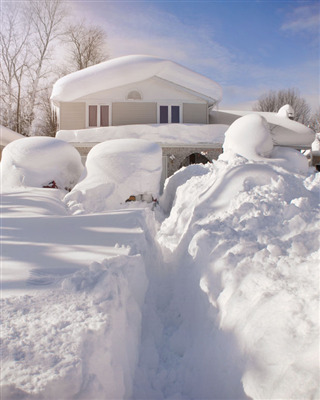 Winter time is here, and that means securing your home from the outside elements. Intelligent Design can help you winterize your roof so that you and your family stay secure throughout the cold season. Below are some of our recommendations for upgrading and reinforcing your roof to protect it from the wind, snow, ice, rain, and freezing temperatures. Before the temperatures drop and the harsh blizzards arrive, we’ll need to replace your old gutters and downspouts to allow water to flow freely off the roof and away from the base of the house. Broken or clogged gutters can result in water either backing up or dripping through the sections. Flowing water is less likely to freeze up than standing water. We can replace the gutter system and install brand new seamless gutters and downspouts. There are several styles, colors, and textures to choose from that will enhance your home’s exterior design. Snow and ice can build up on tree branches and cause them to collapse. Unfortunately, they come crashing down on your roof. You can minimize the possibility of damage by trimming the branches back as well as brush and other items that could potentially hurt your roof. Intelligent Design performs comprehensive roof inspections for both residential and commercial properties. With winter here, a roof inspection could keep small issues from turning into major problems. If there are any issues with your roof, we will identify them and make the necessary repairs. We can get your roof back in excellent condition and ready for the winter season. Proper attic insulation will make your home energy efficient and reduce your energy bills each month. Another reason to insulate your attic is to contain the heat inside your home. Containment will keep snow and ice from melting on the roof and forming ice dams around the edge. When the heat from your furnace rises, it melts the snow on the roof. When the water runs to the side of the roof, it freezes up again. As the ice builds up, it creates a dam that becomes heavier and dangerous. Proper insulation will keep this from happening. Roof ventilation is vital for many reasons. First, it keeps humid air flowing through the roof instead of being trapped inside. Without ventilation, the cold, wet air would freeze up in the attic and roof area. Second, ventilation allows cold air to circulate through the attic so that snow doesn’t melt on the roof and create an ice dam. We often find that homeowners neglect the roof ventilation. Therefore, several problems arise throughout the winter and summertime. Intelligent Design is a roofing company that provides complete roofing installation, repair, and replacement of residential and commercial properties in Minneapolis and St. Paul, Minnesota. We offer fast, efficient service, work of the highest caliber, and affordable rates that stay within your budget. To schedule a free estimate, contact us at 763-315-0745, or you can message us on our contact page.